Aspen 13.2 hh. 12yr old New Forest Pony for sale. Lovely wee showjumper. Preliminary Round Qualifier for Pony Club Dengie 2018 85cm, 2nd place at local Stewartry Show 60cm and 70cm 2017 (beaten by a whisker) and usually in the ribbons due to enthusiastic scopey jump and love of speed. Dressage and Cross country potential. She has jumped 70cm XC. 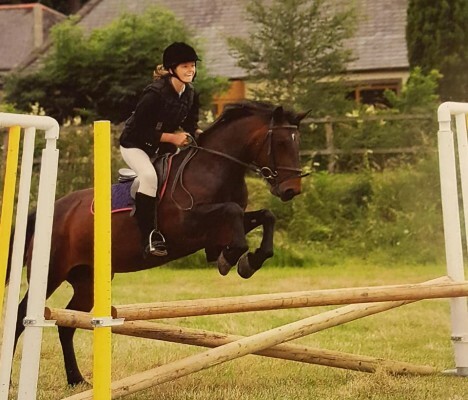 She has done Pony Club, hacks alone or in company. Good to shoe and clip. No problem with the dentist. Loads nicely once she has a routine. However Aspen is not a novice ride and needs a confident rider. She has taught my girls so much and has a lot left to give. £2,500 ono.